Back in December I picked up a Mophie Wireless Charging Base from Amazon for $23. It’s a 7.5watt Qi Wireless charging pad that I am going to use to wirelessly charge my iPhone X. It currently sells for $40 at the Apple Store but you can now get a 2 pack from Amazon for $53 dollars. The Wireless Charging Base comes in black. Inside the box is the charging base, an intrgrated wall charger and cable that plugs directly into the base. It uses a barrel connector rather than a USB C or micro USB connector. It’s relatively thin and compact. 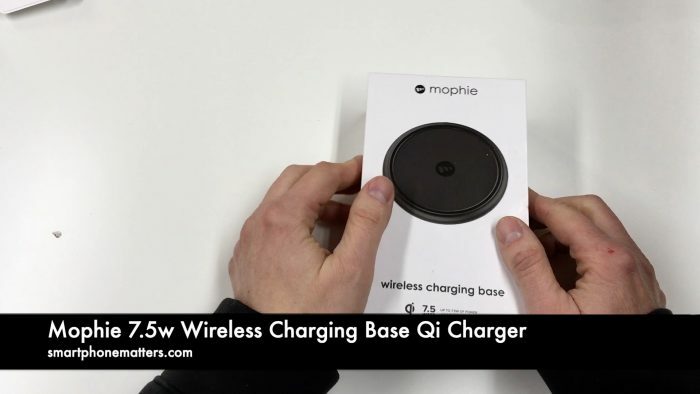 Compared to the two Samsung Qi Wireless chargers’s I have the Mophie is relatively thin and compact. I think it looks nicer in the matte black versus the plasticy look of the Samsung chargers. And, since the Mophie charger is 7.5 watts, it will fas charge my iPhone X. One of the reason’s bought the Mophie, other than that it was on sale, was because it didn’t have a charging light on the pad. I wanted to use it on my nigh table, and didn’t want glowing lights like the Samsung pads. At least I thought it didn’t have a light, but it does. Turns out it’s small enough and dim enough that I didn’t notice it when I looked at this pad in the Apple store and it isn’t bright enough to disturb us at night. So I’m happy with it. I also want to point out that Mophie has an updated 10 watt version on their website. While the 10W might be better for fast charging Samsung or other android phones the extra 2.5wats wouldn’t charge the iPhone X any faster. Copyright © 2019 smartphonematters.com All rights reserved.